This Wednesday it was my Mum’s birthday, so my Dad and I decided to treat her to lunch (by that, I mean I chose the destination and Dad paid). Merridale Estate Cidery was on my Festival bucket list, and Mum’s birthday was a great excuse to finally go. I reserved a table at Merridale’s Bistro, but when we arrived we were the only people there. I’m always a little worried when that happens: what don’t I know? This time, however, we were safe; within half an hour, the bistro was nearly full. And there is good reason why all those people made the trip down Cobble Hill’s country roads on a Wednesday. The good reason is all of it: food, atmosphere, and service. We sat on the sunny patio overlooking the orchard, which made a great place for the kids to run off steam (and ice cream). Our server remembered our request to put a candle on my Mum’s dessert, and was intelligent enough to bring Mum’s dessert out last (a small detail that only the best servers consider). The menu lists local meats and cheeses, and homemade brick-oven breads. All the food was flavourful and timely (not a long wait between the appetizer and main course, which may not suit all patrons but those of us with kids sure appreciate it!). After dessert, Mum and I were booked into the Merridale’s Orchard Spa for a pedicure. Yes, Merridale has a spa. And yes, I made the great sacrifice of having a pedicure so I could share the experience with you, my faithful readers. As we finished our desserts, our delightful estheticians Riley and Kira introduced themselves and escorted us down the path towards the spa. 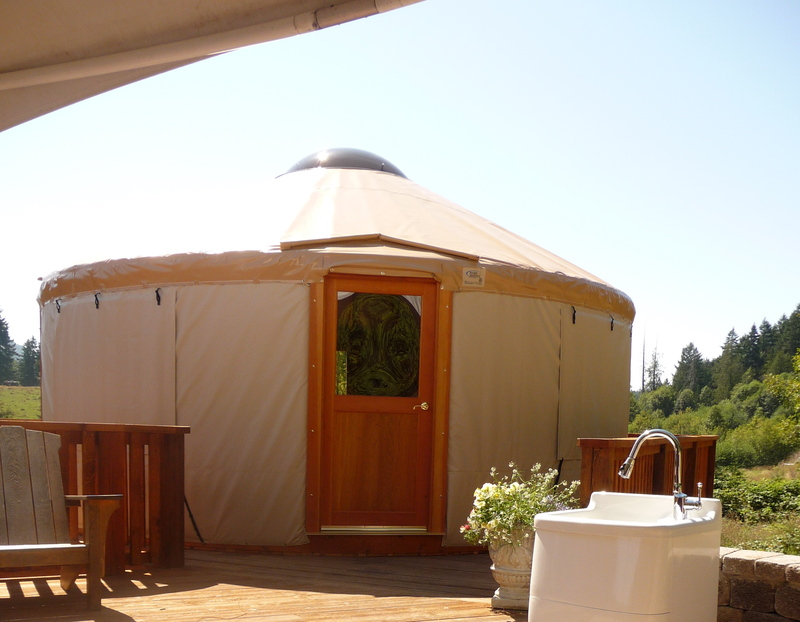 Merridale’s spa consists of a large covered patio, on which sits two yurts: one houses the massage table; the other is a gorgeous bedroom in which a wedding party can prepare, and afterwards the bride and groom can share. Just below the patio is a gazebo where weddings take place overlooking a small pond. Gorgeous. The pedicure stations are set up on the patio, which, on a such a perfect summer’s day, made it all the more relaxing. I have yet to meet Janet & Rick, Merridale’s owners, but I’m guessing, based on our experience in the Bistro and Spa, they have high standards in customer service and style (or maybe they have good help with both). Just before we left I asked the Mister to marry me (again), just so we could host a wedding at Merridale. Oh, and the cider was pretty tasty too. Sounds divine! 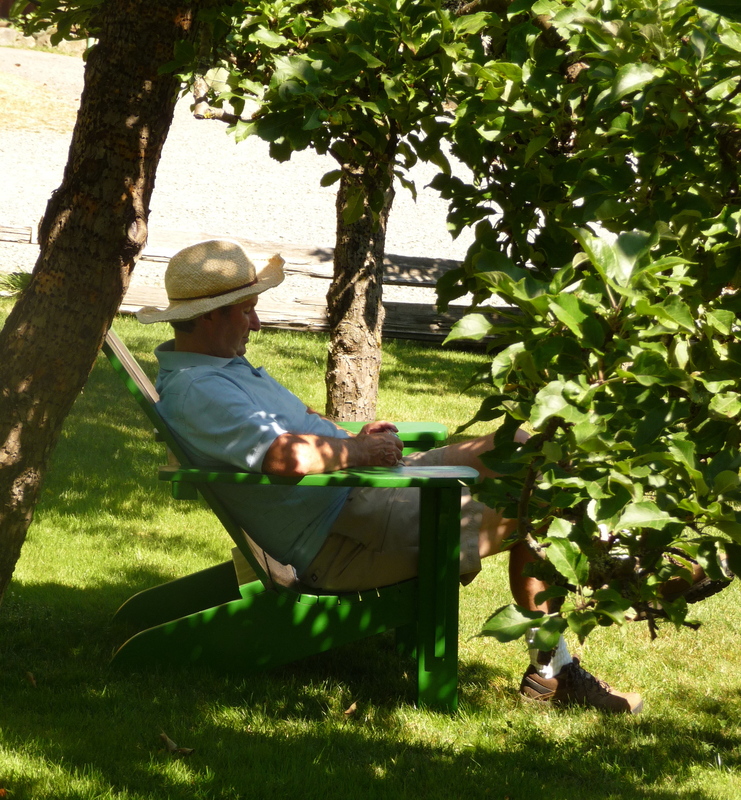 Love the pic of your Dad in the orchard. Now… we will ALL want to get a little taste of Merridale for ourselves – I can hardly wait (but I will!) for the Wine & Culinary Festival in September. Aah the difficult sacrifices we must make living in foodie paradise…Thanks so much for doing all this hard pre-wine fest scouting so that the rest of us can better tailor our schedules. 🙂 You’re certainly building up my anticipation for September!